Today is International Women Human Rights Defenders Day. International Partnership for Human Rights (IPHR) would like to use this opportunity to send a message of encouragement and solidarity to all women activists who are engaged in efforts to promote respect for human rights across the world. Our thoughts go in particular to those women defenders who face intimidation and harassment because of their human rights work and currently are most in need of support. May our joint struggle for human rights continue to change the hearts, minds and actions of those with power to end abuse and ensure accountability and justice! 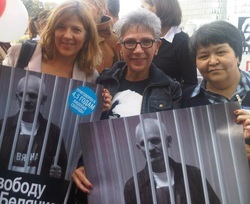 Note: on the picture IPHR Director Brigitte Dufour is seen calling for the release of imprisoned Belarusian human rights defender and Viasna head Ales Bialiatski together with Danuta Przywara (Polish Helsinki Foundation for Human Rights) and Mutabar Tadjibaeva (International human rights organization “Fiery Hearts Club”) in Warsaw in September 2012.